My parents are relatively tech savvy so this doesn’t really help me, but I can see the benefit in this page. Some guys at Google (Where else…) created Teach Parents Tech to make sending out of the box tech support videos to family members relatively easy. In practice a War on Snow is Going to be about as effective as a War on Terror, so I whole heartedly support 4Chans War on Snow. It’s good to see that Anonymous still have a taste for the absurd after their quite serious attacks on Master Card, Paypal et. al. Once a very long time ago I played World of Warcraft, then I realised I was essentially just using it like IRC with pretty 3d graphics. This song which is a parody of Part of your world is however quite amusing. I’m quite impressed by how effective just adding a CAPTCHA to my site has been in preventing spam comments/user registrations. I know it’s to be expected but I’ve gone from getting 170 spam comments and about 30 spam registrations a day to just one spam comment and no registrations. Solve Media from Solve Media on Vimeo. It would be quite cool to have CAPTCHA that made you play a round of space invaders or Pacman or something like that and wouldn’t let you comment till you win… Hmmm… Cool maybe, annoying definitely. Legend of Captcha, originally uploaded by spacesick. What if The Legend of Zelda was a online Game? 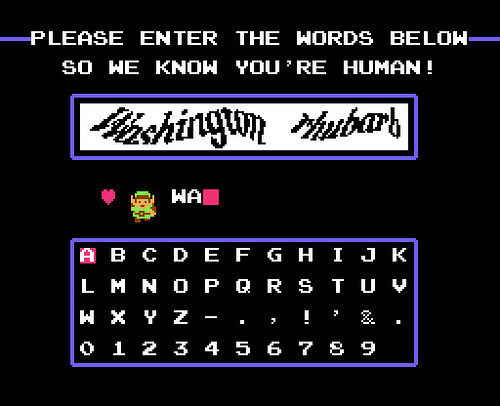 I’m seeing a Meme forming here Captchas for 8 Bit Games… And Go! I’ve been a stark opponent of the iPad, I think as part of my Android advocacy I was blinded to this device and tarred it with the same brush I tar the iPhone. Initially I think the heinous price was my main issue; although I still think that the device is ridiculously expensive. I’ve still got some issues with missing features, notably the lack of an SD card slot. However I’ve had a chance to play with Avarinne’s new iPad and I have to say I’m impressed, it’s not an oversized iPhone/iPod Touch, it’s a netbook without a physical keyboard running a sleek UI. The device its self is wonderfully thin, the screen is bright and crisp, and the battery lasts for ages. As much as I disagree with Apple’s review process, it does separate the wheat from the chaff, and I think because of this the wheat is overall of better quality. Also the fact that the iOS has Apple’s backing means that there are an awful lot of “Official” versions of games available, like Settlers of Catan, Carcassonne and Scrabble. All of these should be on the Android market none of them are. I don’t know why they aren’t I think Android has the hacker community hooked, but it’s yet to convince big business that it’s a viable platform. Maybe they don’t want to take the risk of developing for a platform where people are used to getting everything for free? Maybe it’s the fact that it’s a lot easier to pirate Android software because you can install software that hasn’t come from the market? Maybe it’s the fact that despite the fact that Android is supposedly gaining market share over the iPhone, people who buy iPhones buy them because of the apps and people who buy Android phones buy then because they are what the guy in the shop recommends they get as the latest whizbang gizmo, so they don’t even bother to explore the apps. It’s not like Android users don’t download good software when it is released, when Angry Birds was released for Android, so many people downloaded it that it brought down the servers of GetJar. With any luck that will prove to people that Android users are willing to download software. The problem is that they were all free downloads, Angry Birds on Android is add supported, so no one bought it. I think that’s one of the major issues, Android users have a sense of entitlement to free software, if they can’t get it for free they don’t bother, or they pirate it. I’ve only bought one game on my phone, Avarinne has bought 2 and a live wallpaper. Contrast this with the fact that within minutes of getting her iPad Avarinne had bought several apps and was merrily playing about with them? Are apps easier to find on the iPad? Are they better? Are they easier to buy? I don’t know. But do know that I am impressed with the iPad. I wouldn’t pay £600 odd pounds to get one outright because I never have that kind of money lying about, but I would consider paying £199 and then a monthly subscription for data to cover the cost, it just so happens that both Three and Orange have just announced that exact deal. £25/a month for 15 Gig internet on Three and £27-£25/month on Orange (Depending on whether you have an existing Orange contract) for just 1 Gig. Both at however 24 month contracts and you end up paying £200 more than you would have for the iPad had you bought in in store, that £200 is £40 less than you would have paid for £10/month contract for data though so it is a case of swings and roundabouts. An SD Slot, possibly also a USB. A Faster (Dual Core?) processor. Better Support for mobile networks in the US which no one outside of America cares about. The link was to a Finnish site advertising “Instant Loans” (Thank you Google Translate). I have to say it’s brightened up my otherwise snowy day. 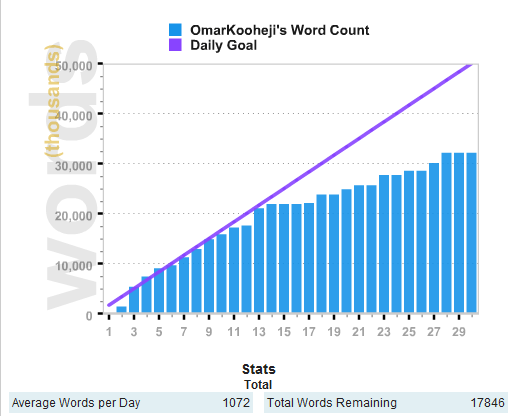 I started fairly well, the reason I don’t have a word count on the first day was that I couldn’t access the NaNoWriMo website because it was so busy. About halfway through I hit the wall as it were, I had a few social events that got in the way and I got a seriously bad case of writers block. I think for NaNoWriMo your story has to slightly whimsical, and able to change at a moments notice. I do admit that I used the “A man bursts in with a gun” technique” once when I was at a complete loss for where to go. Next year I will try something more within my comfort zone, and something where I can just go on a tangent when I need to without worrying about it destroying my whole world. I read an article by Max Barry called 15 ways to write a novel on the 30th and I kind of agree with some of what he said, NaNoWriMo is a rubbish way to write a novel, it’s a great way to get you writing though, which I suppose can lead to writing a novel. Webarh? More like Web Aargh! Earlier this weekend I got a Facebook message from a friend saying that my website was redirecting to a malware site. Thankfully I was near a computer and had a look at it, every page view was redirecting to a site that installed malware on your computer. Thankfully most browsers recognise this fact and present you with a warning page. Note the numbers at the end are just a random identifier, probably so that they can tell where it originated. The other tells my web server to send all requests for ANY PAGES to that same URL. It’s a two pronged attack, if you have script blocking software on your browser the .htaccess file makes the server send you to the malware site, if your server ignores the .htaccess file, then there is a chance that the script will be work. Eitherway when you end up at that URL no doubt the website tries to exploit whatever vulnerabilities exist in your browser to install bad software on your computer. I diligently deleted all the .htaccess files and removed the script line from every file I could find it in. I did a grep for webarh.com over the entire website, and removed any references to it I could find, I even changed the ftp password on my site because I read that sometimes that’s how webarh infects your server. It looked like all was good for about 18 hours my site was back up and running and everything was hunky dory. At about midnight last night I got a text from someone else telling me my site was broken again. I check and sure enough it was redirecting again, but only partially, some of the other domains I host in subdirectories of my web space were okay. I’d heard that the webarh/funnysignage redirect sometimes puts back doors into your site, I didn’t have the time to look through every php file on my server which hosts 4 wordpress installs and a phpbb install so I took a deep breath and deleted everything… Most of my content was in the database, the only content that wordpress stores on disk is images and stuff you have uploaded. Of course I took a backup of the site beforehand just in case. I’ve so far restored two of my wordpress blogs, and everything seems okay, I deleted an old version of phpMyAdmin I had lying about from before my service provider gave me direct access to the database. I’ve not deleted the phpBB install yet as that didn’t seem to be infected aside from the fact that the .htaccess file was causing everything to redirect to the malware site. So the next step would be to remove that too. There is a backdoor in the SQL somewhere, then I’m really screwed. There is a backdoor in phpBB, in which case I’ll have to reinstall that. I’m hoping that None of the above apply… And that I’ll be safe from here on out, I think that the root cause of this was the fact that one of my sites didn’t have the latest version of WordPress installed on it, my reasoning behind this is that WordPress recently released a security update that allowed code to be executed etc… I’d updated my main site but had forgotten to update the others. I’d appreciate anyone who notices any issues on my website getting in touch with me to tell me so.